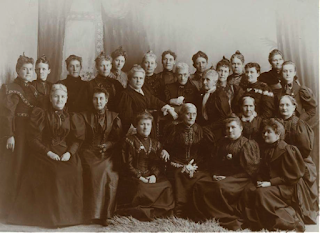 One of the questions I had as I researched Mormon women and the suffrage movement was what role Mormon women played in the movement after their suffrage was enshrined in the Utah constitution in 1896. Would Mormon women care enough about other women's rights to continue the fight? A great resource for information as I researched was Better Days 2020 Utah, a nonprofit organized to celebrate next year's 150th anniversary of Utah women voting in 2020 (suffrage was originally granted in 1870, before being taken away in 1887 and then restored in 1896). One of their blog posts introduced me to Ellen Lovern Robinson, a Mormon and member of the National Woman's Party ("NWP"). 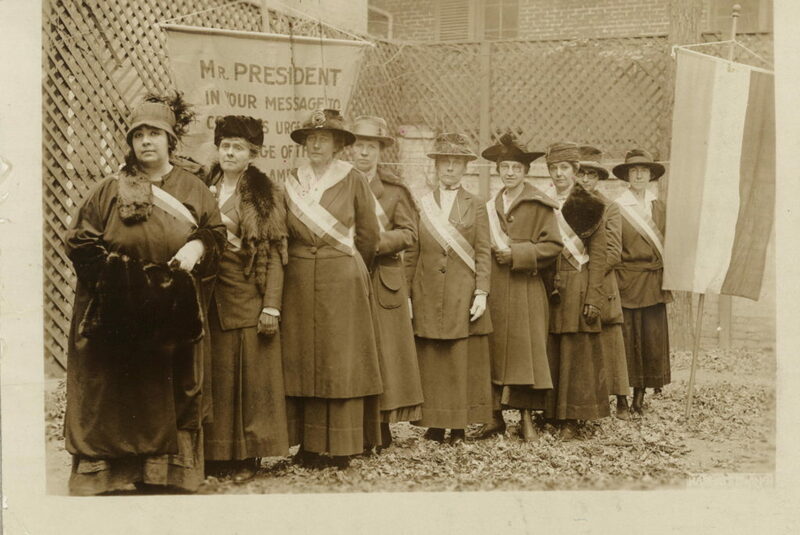 Alice Paul founded the NWP in 1916, to protest and drive towards a federal amendment supporting women's suffrage. 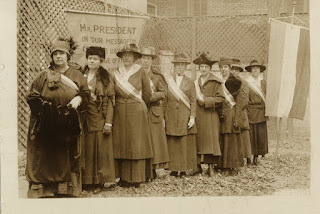 Members of the NWP were the first people to protest in front of the White House in an effort to turn President Woodrow Wilson into a suffrage supporter. They began in January 1917, shortly before Wilson's 2nd inauguration, and it was considered a radical and provoking step. Respectable suffrage supporters like Carrie Chapman Catt, president of the National American Women's Suffrage Association (NAWSA), were scandalized when the NWP continued protesting after the U.S. joined World War I. It was considered disloyal and treasonous. Alice Paul herself was arrested on October 20, 2017 while carrying a banner with Wilson's own words: "The time has come to conquer or submit, for us there can be but one choice. We have made it." Once Alice Paul was sentenced to 7 months in prison, her colleague Lucy Burns carried on the fight and rallied the members of the NWP. Ellen Lovern Robinson came from Utah to join the protesters on November 10, 1917. The protesters were arrested and sent to the Occoquan Workhouse in Lorton, Virginia. Lovern was there for the Night of Terror, when suffragists were brutalized and thrown into dark solitary confinement. Silent Sentinels, with Mormon Ellen Lovern Robertson fourth from right. I'm grateful for those who were radical enough to get arrested and risk everything for suffrage. It's especially impressive in Lovern's case, when she already had the right to vote, but was willing to fight for others' rights by protesting. Alice Paul planned it all with meticulous attention to detail and robust respect for the pageantry of the occasion. She spent over $20,000, which at the time, was an immense amount of money. This graphic lays out the order of the thousands of women who marched in the parade, and the Smithsonian has a really good interactive article explaining each part of the parade. One of the things that is so interesting about history is that it's all interconnected. Alice Paul and Lucy Burns are the ones who lead the way, and we continue to build on their foundation today. As I've given a couple versions of my suffrage tour, I've been grateful that people have reminded me and asked questions that bring women of color into the story. Their contributions are often overlooked, but people of color were vital in the struggle for the 19th amendment, not to mention the continuing fight for civil rights that would follow the decades after the passage of the 19th amendment. One of the African American heroines of suffrage and women's rights is Ida B. Wells, who had to fight to be included when many white women were uncomfortable with that and actively worked against it. This article details a bit of her struggle with Frances Willard, leader of the temperance anti-alcohol movement. This article introduced me to Frances Ellen Watkins Harper, who I didn't know anything about until I read the article last week. That article also goes into detail on the many descendants of slaves who were involved in the suffrage and civil rights fights. D.C. natives should learn more about Mary Church Terrell, a D.C. heroine of the struggle for equal treatment of restaurants decades before the sit-ins and lunch counter protests of the 1960s. The Washington Post did a series of articles on her struggle to enforce D.C.'s anti-discrimination laws in the early 20th century, which can be found here and here. I wish I knew more about women of color involved in the Mormon suffrage movement. So far, the only thing I have seen was this brief Twitter post on Elizabeth Taylor, a Utah African American suffragist. Would love to know more about her and others like her, so if you know of any resources, hit me up! Martha ("Mattie") Hughes Cannon's life is often reduced to one story - she ran against her husband in an election in 1896. She won, he lost, and she served one term as the first woman state senator in the nation's history. But there is a lot more to her story, including medical school, the trials of being a plural wife, and a stint in hiding in England. Utah's PBS affiliate put together this video which tells her story in more detail. Utah plans to honor her with a statue in the Capitol's Statuary Hall in D.C. in 2020. I'm grateful for her courage and moxie under difficult circumstances. 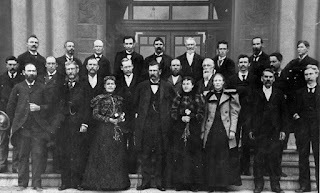 Utah State Senate in 1897. 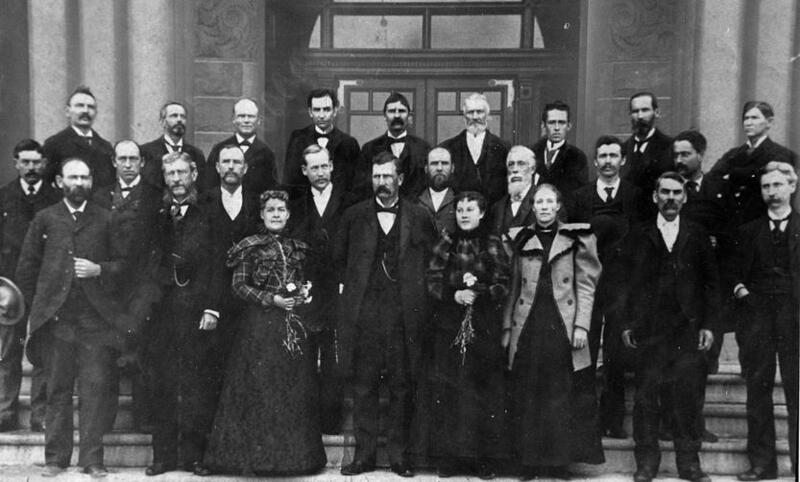 Mattie is standing left of center. One of my favorite details about her election is that in a newspaper editorial endorsing Mattie over her husband Angus, the Salt Lake Herald had this to say: "Mrs. Mattie Hughes Cannon, his wife, is the better man of the two. Send Mrs. Cannon to the State Senate and let Mr. Cannon, as a Republican, remain at home to manage home industry" (emphasis added). You can learn more about here by watching the linked video, or reading her Wikipedia page. My last post was about Sarah Granger Kimball, but really she deserves ALL the posts. She's pretty amazing, and there is so much to love about her story. Sarah was one of the instigators of Relief Society when she and Margaret Cook decided they wanted to form a benevolent society to make shirts for temple workers in Nauvoo in 1842. She was a secure woman in her faith - although married to a nonmember, she remained steadfast (eventually her husband, Hiram, converted). Sarah's husband was killed in a steamship explosion while on his way to serve a mission in Hawaii, but she stayed faithful, serving as a local Relief Society President for 42 years! Now, that is what I would call dedication. One of her most ambitious projects was a Relief Society Hall for the sisters to gather and to sell handicrafts. Her Bishop suggested a site for the hall, but she didn't agree - purchasing and selecting the site herself and laying the cornerstone with her own hands in 1868. Built for the sisters of the Salt Lake 15th Ward, it was the first ever Relief Society building in the church. In 1870, Sarah was serving as Relief Society President and was one of the instigators of several mass meetings in January 1870, convened to protest the federal government's proposed anti-polygamy measures. On February 12, the Utah territorial legislature voted unanimously to extend voting rights to women, partly as a result of the agitation of Sarah and others. 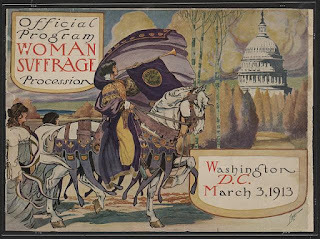 Said that she had waited patiently a long time, and now that we were granted the right of suffrage, she would openly declare herself a womans rights woman, and called upon those who would to back her up, whereupon many manifested their approval. Said her experience in life had been different to that of many, had moved in all grades of Society, had been both rich and poor, had always seen much good and inteligence in woman, the interests of man and woman cannot be seperated, for the man is not without the woman or the woman without the man in the Lord. She spoke of the foolish custom which deprived the mother of having control over her sons at a certain age. Said she saw the foreshadowing of a brighter day in this respect in the future, said she had entertained ideas that appeared wild that she thought would yet be considered woman’s rights. Spoke of the remarks made by bro. Rockwood lately, who said women would have as much prejudice to overcome in occupying certain positions as the men would in letting them, said he considered a woman a helpmate in every department of life. I don't know for sure, but I like to think that one of the reasons Sarah Kimball declared herself a "Women's Rights Woman" in 1870 was due to the influence of reading "The Revolution." I can't think of a better way to celebrate today's birthday of the Relief Society than by celebrating Sarah Kimball, a true pioneer and one of my heroes! Women as a rule have listened to the asserting voice of men and have been led by their precepts too long. It has slowly dawned upon woman's understanding that man as a ruler is weak; in many respects very weak and unreliable, (remember we love him still,) and she has been compelled for the good of the great family to explore new paths leading to broader fields of helpfulness. Women will make mistakes, and profit by them, all along the unbroken pathway, but never so fatally disastrous mistakes as men have made while holding exclusive power. You assert that suffrage advocates take a wrong shoot, start out on leaves, or small branches, and they must change tactics, etc., this reminds me of early Colonial history. Did our forefathers when they struck for freedom, ask their usurping oppressors what shoot they should take, what tactics they should adopt? In her editorial, Kimball also argues in favor of women judges and women police forces. You can read her whole editorial here. There's also a full length article about her here. If you can vote, thank a suffragist! I thought I'd share a quote from Eliza R. Snow. 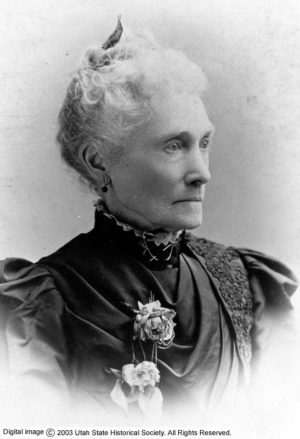 She actually was more of a traditionalist than I realized - not overall a huge women's suffrage fan, but once Utah women were granted the vote in 1870 she got on board. She said in 1873 that "[God] has given us the right of franchise...and it is as necessary to vote as it is to pray." Heber J. Grant, the Suffragist! American Women Voted in the 18th Century!